Peanuts #3, the third issue of the monthly Peanuts comic book series featuring new stories and reprints of classic Sunday Peanuts comics, is on sale starting Wednesday, March 21. Comic Book Resources has a 5-page preview. You can buy the latest issue at your local comic book store (use the Comic Shop Locator to find one near you), or you can order it directly from Boom! Studios (but you'll have to pay for shipping, too). 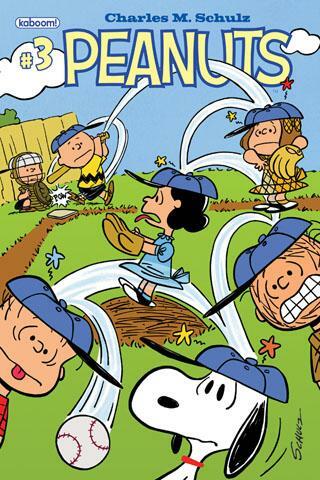 For more information about the new Peanuts comic book series, see our blog post about the first issue. I saw this book at a comic store. One comic featured Linus on roller skates.